My wife, Abbe, and I were living the American Dream in Naples, Florida. We had moved there in 2003 from the chilly Northeast for the warmer and sunnier climate. We had a beautiful condo directly on the Gulf of Mexico from where we could watch dolphins swim by. However, we had a big and expensive mortgage, condo fees, and the maintenance of two cars, and after 13 years in Naples, we noticed the area was getting expensive and crowded. As long as we both continued working, we could maintain our lifestyle…but we decided it was time for a change and a new adventure. We wanted to improve the quality of our life, be able to enjoy a slower lifestyle, and find a place to stretch the value of our dollar. So in 2013, we attended an International Living conference to figure out where we’d like to go. We looked at a number of countries but Panama’s proximity to the U.S. where all our family and friends lived, the attractive Pensionado program, the cost of living, good medical care, and the country’s use of the U.S. dollar were big draws for us. In April 2014, we took a trip to Panama where we attended the IL Fast Track Panama Conference, after which we spent three weeks exploring potential retirement locations. 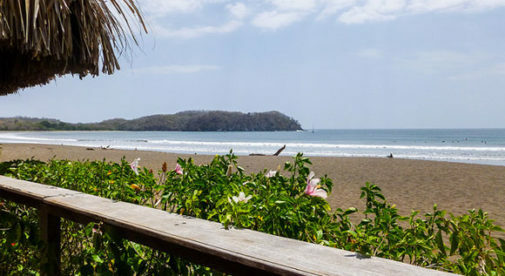 We were drawn to Pedasí by the proximity to the ocean, the small-town feel, the clean air, the friendly nature of the people, and the established expat community. In many ways, Pedasí reminds me of small-town America 50 years ago. It’s a small fishing village with a colorfully painted downtown. Beautiful deserted sandy beaches are less than three miles from the center of town. Life here centers around the church on the town square and all festivities are held there. And Pedasí has several good restaurants, B&Bs, small grocery stores, two bakeries, gas stations, and a bank. In Pedasí, we are fortunate enough to own our home and we only need one vehicle. This has greatly reduced our cost of living and our stress levels. I’m collecting my Social Security and we are live comfortably on $2,000 a month. The cost of living in Pedasí is generally lower than back in Florida. We can eat lunch out for between $3 and $12 each, depending on where we eat. A beer is a $1 a bottle, our car insurance is just $600 for the year, and we can get a housekeeper in to clean our house for just $15 for a half day. Our healthcare needs are satisfied through a new clinic on the edge of town. Abbe spent $2 to see the doctor for a nasty knife cut on her finger and $2 for two stitches. She had to get an antibiotic too which set her back just $8. For more serious ailments, very good English speaking doctors are 45 miles away in the small city of Chitré. I saw an excellent internal medicine doctor who spent over an hour with me for my initial consultation and the cost was $35. My wife saw an ophthalmologist and had a full examination for $42. Both doctors gave us their cell phone numbers and told us to call them with any questions. Living in Pedasí, Abbe and I both have so much more time to do the things we love. I’ve revived my photography hobby and am also going to start writing (I have a technical writing background). Abbe enjoys relaxing and reading and we’ve both started volunteering with the local animal charity. Relaxing on my porch each morning with a cup of fresh coffee, listening to the birds, gives me time to reflect on how happy we are in Pedasí…and how lucky we are to be here.